Of all the factors to consider when planning your special event the right entertainment should be the least of your worries! Gloria & Friends will provide you with the live sound that will make your party memorable long after the last guest has gone home. So, if you are looking for great entertainment for your event, look no further. 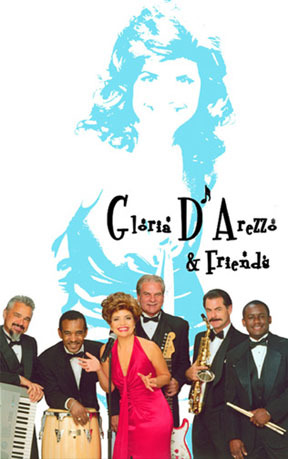 Gloria & Friends play a wide variety of music ­ Smooth Jazz, Pop, Disco, Rock Funk Motown, and Country. The band can provide 2 to 6 musicians depending on your event requirements. Gloria has been providing quality great entertainment in the greater southwest for many years. Her show features an eclectic collection of songs from the sixties to the top forty hits of today. Backed by an ensemble of experienced musicians she can take you back to the early days of Rock n Roll, or let you dance to the pop tunes currently filling the airwaves. The band is comprised of experienced professional musicians. The band is comfortable in tuxedos or blue jeans. The band¹s goal at each performance is to make you and your esteemed guests a part of their show. Gloria & Friends is equipped to handle any size room. They can provide sound, lights, and music for the breaks, and all accessories necessary to make your evening a complete entertainment success. Join the many satisfied clients that continue to use this high-energy performer over and over year after year. Gloria will be happy to provide a list of some of her private clients. Her many repeat customers will tell you to book Gloria & Friends and your worries are over! "Great variety of music, good showmanship & Diva G did a great job at reading the crowd and adjusting music as needed. The band received many compliments from our employers." "Gloria and the band were amazing. We had many guests comment on what a great band they were. Fabulous!" "There are not enough words to tell you how pleased we were with Diva G. I had not heard them perform before and they were FANTASTIC! My friends and family are still talking about how great they were weeks later. No one wanted them to stop playing. We all danced and danced." "Great Energy - Really got the group going. Love having them!" "The band was fabulous. Everyone had a great time and she got rave reviews. Thanks!" "We have had several people say how much fun our reception was and how great the band was. Even the director of our country club said it was one of the best bands she had ever seen and worked with." "Gloria and her band were fabulous! Everyone had such a good time. She (Gloria) had great suggestions to replace the traditional bride's bouquet toss & groom's garter toss. The wedding party had a ball with their dance with the instruments. The dancing is the best part of the wedding video. Diva G and her band were totally responsible for that. Thank you so much!" Mr. Magic, Grover Washington Jr.